For Priority Consideration: March 1 for Fall. September 1 for Spring. Domestic applicants: July 1 for Fall. November 1 for Spring. International applicants: March 1 for Fall. September 1 for Spring. The actuarial science program provides opportunities for students seeking employment in the areas of life insurance, pensions, and property or casualty insurance. 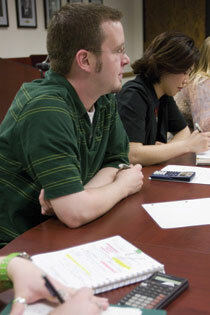 The program has produced actuaries in the United States, Canada, and over a dozen other countries. The program is available for students who have a strong aptitude for mathematics as well as a solid mathematical preparation, including calculus and mathematical statistics. Many successful students, however, have backgrounds in education or in other non-mathematical fields. The degree requires a minimum of 36 hours without a thesis. At least nine hours must be in a minor area such as computer science, insurance, finance, statistics, or economics. Students are encouraged to take as many classes as possible in finance and insurance and to join the Actuarial Science Club. The club provides students with a better understanding of the actuarial profession, assists in preparing for the professional actuarial examinations, and fosters close relationships among students in the common pursuit of an career in actuarial science. For additional details check out the dept./program website: Actuarial Science.